For catering equipment, there is only one brand Thermal Products will distribute, and that is Jomack’s Stainless Steel Catering Equipment. Made in Australia and of the finest quality and reasonably priced, why would you want anything less? 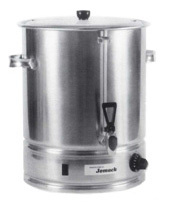 Jomack’s Stainless Steel Hot Water Urns are ideal for factories,offices, hotels, restaurants, take-away food shops, sporting clubs, schools, etc. Constructed of high quality stainless steel, all seams welded. Brass chrome-plated tap with sight glass incorporated. 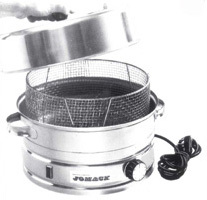 Jomack’s Stainless Steel Counter Fryers come in single pan and double pan units as displayed. Both are 150mm deep and feature swing back elements. The Single Pan unit has 1 x 2400 Watt element and measures 270mm wide, 420mm deep and 300mm high. The Double Pan unit has 2 x 2400 Watt elements, two baskets, dual thermostats and measures 540mm wide, 420mm deep and 300mm high. The Jomack Stainless Steel Food Steamer is the perfect product for use in Hotels, Restaurants, Canteens, Take-Away Food Shops, etc. It steams dim sims, hot dogs, chickens, vegetables and most other foods requiring steaming to perfection. Not surprisingly, made from high quality polished stainless steel, it includes a stainless steel wire mesh basket, which is a very hygienic and easy to clean product. Electrical Rating of 2400Watt / 240Volt. 300mm Diameter x 240mm high. It is also available non-electric for gas or hotplate use. Jomack’s small Stainless Steel Bain Maries are suited to small food outlets. They come in 3 sizes, 1, 2 and 3 modules. They all feature various pot layouts, simmerstat control, all welded stainless steel and all operate on a 10amp 3-pin plug. 3 Module unit: 1800 Watt 24v, 990mm long, 540mm wide and 300mm high. 2 Module unit: 1800 Watt 240v, 660mm long, 540mm wide and 300mm high. 1 Module unit: 1200 Watt 240v, 610mm long, 330mm wide and 210mm high. 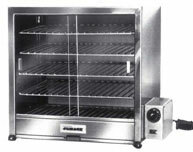 Jomack Stainless Steel Pie Warmers are ideal for Hot Pies, Sausage Rolls, Pasties and warming plates. They feature Easy-Clean, hygienic stainless steel, simmerstat control, glass back and doors. They come in 2 sizes. The PW5 is 1200 Watt 240 Volt, measuring 610mm long, 365mm wide and 530mm high. It has a capacity of approximately 50 pies. The PW1 is 1500 Watt 240V, measuring 840mm long, 365mm wide and 530mm high. This unit has a capacity for approximately 100 pies. Measuring 840mm long, 365mm wide and 530mm high, this unit also has a capacity of approximately 100 pies. It is available in powder coated black and white, as well as the traditional polished stainless steel.